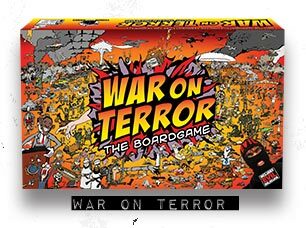 "Fight the terrorists, fund the terrorists, be the terrorists"
War on Terror is a board game for 3-6 players. It is probably the only game in history to have been seized by the police, exhibited in a major art gallery and used as a sitcom prop all in the space of the same year. Imagine an unholy alliance between Risk, Monopoly, Diplomacy, Settlers of Catan and Poker and you're halfway there. Add an Evil Balaclava, the Axis of Evil, Oil, Terrorists, Nuclear Weapons and God ... and that's the level of joyous family fun that we're talking about. Just a little taster of the adventure to be had inside the box. From left to right: Regime Change, Terrorist Attack, Gitmo Holiday Camp, Global Jihad, Suicide Bomber, God's On My Side.